In an effort to further support athletes finishing their junior international swimming years and aid them in transitioning to senior international representation, Swim Ireland will be selecting a squad to race at this year’s Golden Bear Meet in Zagreb, Croatia. A maximum of 8 athletes will be selected for the 2-day competition scheduled for July 2nd and July 3rd, with the Croatian-hosted meet serving as a meaningful and beneficial competitive opportunity. For males born in 1999/2000 and females born in 2000/2001, the competition is geared towards preparation for prospective racing at future World Championships in 2021/2023, as well as the 2024 Olympics. For those males and females born earlier, in the 1998/1999 range, Swim Ireland says participating in the Golden Bear Meet’s objective is aimed at preparation for the same World Championships, but also next year’s Olympic Games in Tokyo. The squad for this Croatia experience will be selected from the 2019 Irish Open Championships taking place in late March. You can read the entire Swim Ireland selection policy for the Golden Bear Meet here. 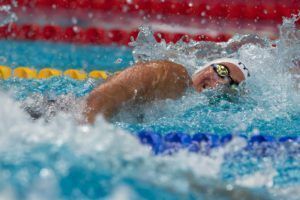 It’s unknown at this time if the Croatian meet will serve as a possible qualification meet for the 2020 Olympic Games, as FINA will not be publishing its official list of qualifying events until later this month.